I was playing with the Inspection UI, and noticed a couple more things. with how file and class icons are decorated with lock/unlocked icon. 1) The right-click popup menu on an IDE profile has "Set as Project Default"
which is always disabled. Shouldn't this be "Set as IDE Default"? of the icon, but my default project profile is not decorated. 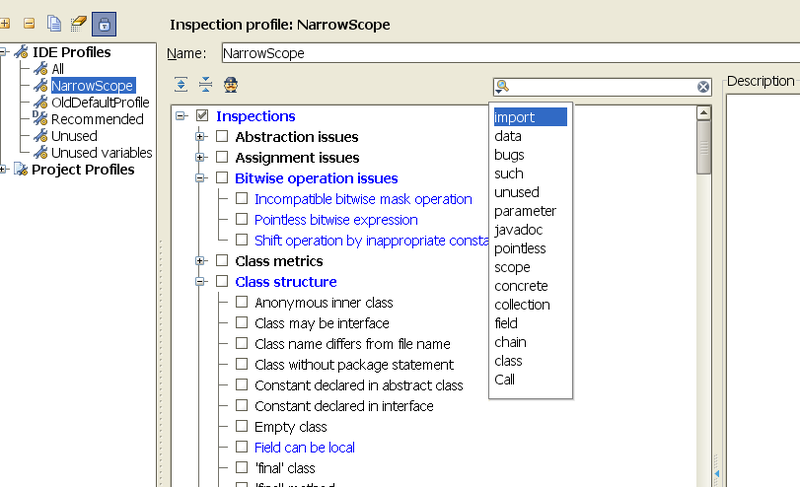 a profile assignment rule would default to the IDE profile. project profile is a document decorated with wrench/gear in bottom-right corner. status bar that shows the current editor highlighting profile. you can use mr. inspector for the profile icons. Currently, the search editfield box doesn't support a user's basic editing keybindings. This isn't just a problem for IDE SEttings->Errors dialog, but all throughout IDEA there is this problem. the search field. Only after you starting typing the first letter does it appear. With default modificator profile icon becomes like icons from Project View. be possible to do it. Thank you. There is already special project profile for such cases. throughout IDEA there is this problem. Issue #6 Search history dropdown appears after clear search field. 1) change mr. inspection icon to a globe for the 'show/hide global inspections"
document icon for the base. more useful if they appear at the top. their own scroll bars if and when necessary. Clear text action now available in group others. Maxim - is 800x600 really that common anymore? I don't want another keybinding. I want IDEA's textfield to respect the user's existing editor keybindings. editor actions. 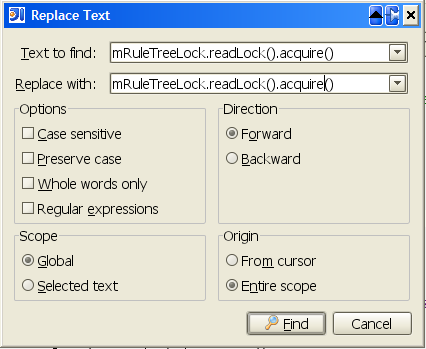 Bascially, any editor actions which operate on a character, word, or single line of text. the editor. Also, all keybindings attached to each action should be supported. and Move Caret to Text End in addition to Home and End keybindings. in particular has been annoying on some of the search dialogs.